The Session opened in the presence of Ministers from AU Members States, the Regional Economic Communities, and representatives from the development partners and international organizations. The AU Commissioner for Rural Economy and Agriculture, H.E Josefa Leonel Correia Sacko, delivered an opening address on behalf of H.E. Mr. Moussa Faki Mahamat, AUC Chairperson and noted that the newly developed AU Strategy on Gender Equality and Women’s Empowerment, which this STC will adopt, will assist in translating commitments into concrete, transformational and sustainable actions to achieve our common goal of gender equality and women's empowerment in Africa. 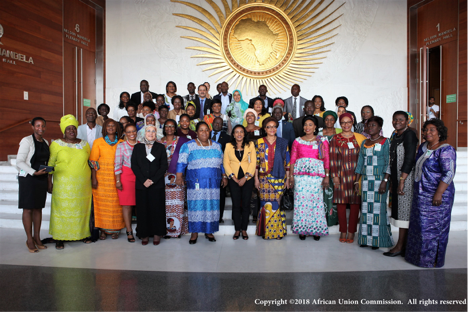 The Chairperson’s statement also called for the acceleration of the establishment of the "Fund of African Women Leaders", which was recommended during the 2nd Forum of the Network of African Women Leaders in Addis Ababa, from 24-26 April 2018. In line with the AU’s 2018 theme on “Winning the Fight against Corruption: A Sustainable Path to Africa’s Transformation”, the Chairperson noted the recommendation to include at least 30% of women in the governing bodies of anti-corruption structures, so that the specific concerns of women are taken into account. The AUC will organize, before the end of 2018, a High Level Panel to discuss the role of women in the fight against corruption and count on the support of all Ministers for its materialization. In her introductory remarks, Mrs. Mahawa Kaba-Wheeler, Director of the Women, Gender and Development Directorate (WGDD) of the African Union Commission (AUC), highlighted that the 3rd STC is very important as it will examine and adopt the strategy on gender equality and women's empowerment and other documents that are essential for the advancement of women on the African continent. “The development of the strategy on gender equality and women's empowerment that you will have the opportunity to validate today is part of the transformational journey towards Agenda 2063 ” she added. This Strategy will serve as a road map that defines the priority actions, investment centers and strategic partnerships in line with continental and international commitments on Gender Equality and Women’s Empowerment. H.E. Yalem Tsegaye, Minister of Women and Children Affairs of the Federal Democratic Republic of Ethiopia, in her opening remarks, reminded the meeting of the marginalization that women still experience in different spheres of life and called Member States and the Bureau of the STC to ensure the social and economic empowerment of women. The STC should also help to identify avenues of cooperation among the Member States to work together to achieve gender equality and women’s empowerment in Africa and to implement the new AU Gender Strategy, she remarked. In her opening remarks, the outgoing Chairperson of the Bureau of the STC H.E Dr. Jean A.N. Kalilani, Minister of Gender, Children, Disability and Social Welfare of the Republic of Malawi expressed her appreciation for the support received from the Member States. Preceded by the Expert Session, the Ministerial Session will consider and adopt Experts reports on: the New African Union Gender Equality and Women’s Empowerment Strategy, the Evaluation Report of the 2009 Gender Policy, the African Gender Scorecard, the Fund for African Women, and the report on enhancing WGDD policy platforms. The Ministers will also be briefed on the AU Flagship programmes including: e-network, aviation infrastructure and ICT for girls, mainstreaming Gender in the African Continental Free Trade Area, and Free Movement of people. Other presentations included Pan African Women’s Organisation (PAWO) and Network of African Women Leaders. The outcomes of the 3rd STC-GEWE will be forwarded to the forthcoming Summit of the AU Assembly to be held in Nouakchott, Mauritania in June/July 2018.